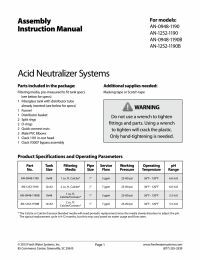 The Acid Neutralizing Filter System utilizes the Clack 1191 In/Out Valve for superior upflow pH neutralization. 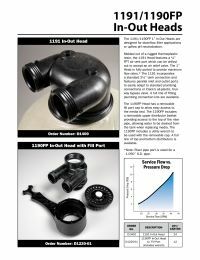 The 1191 valve is molded out a rugged thermoplastic resin that features a 1/4" FPT air vent port which can be drilled out to accept an air relief valve. Calcite effectively corrects pH enough to reach a non-corrosive equilibrium. It does not overcorrect under normal conditions. When water come into contact with Calcite, acidic water slowly dissolve the calcium carbonate to raise the pH, which reduces the potential leaching of copper, lead, and other metals found in typical plumbing systems. The Calcite bed will have to be periodically replenished as the Calcite is depleted. Calcite can be effectively combined with FloMag Corosex to combine the high flow neutralization properties of Corosex, along with the slower reacting low flow properties of Calcite, increasing the ability to correct low pH. Use Calcite only for pH levels 6.0 - 6.8. Use Calcite/Corosex for pH levels 5.5 - 6.0. Acid neutralizers introduce minerals back into the water to raise the pH of the water. Consider the HydroBlend SC-605 Scale Control System that prevents scale build-up in your pipes and water heaters. Over time, HydroBlend also helps soften and remove existing mineral scale deposits.